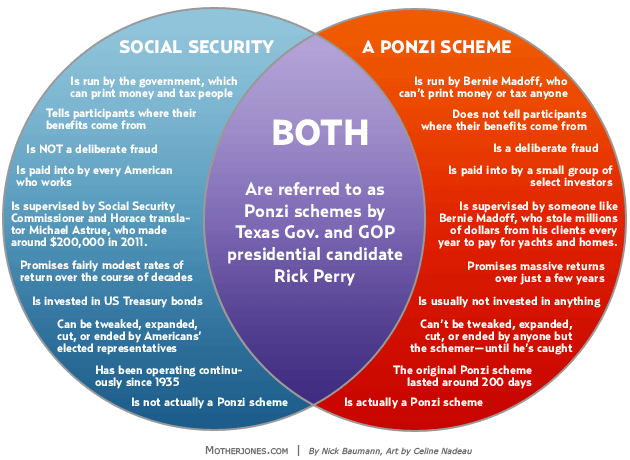 The Urban Politico: Social Security: Is it a Ponzi Scheme? Let’s be honest, Social Security is as close to being a Ponzi scheme as you can get without actually being a Ponzi scheme. It doesn’t have the necessary elements to be considered a Ponzi scheme as those on the right would have you to believe; however, it does, on a superficial level, contain some similar characteristics of a Ponzi scheme which goes against what those on the left would have you to believe. Check out Mother Jones' Venn Diagram [to the right] for other differences. You see, on its face, Social Security, which is a pay-as-you-go program, is similar to a Ponzi scheme in that it uses money from participants who join later to pay the benefits of those participants that joined earlier. How it is set up today, once you start receiving your Social Security benefits, it takes just over 3 years for you to recollect every dollar you paid; each generation takes more out of the trust fund than they put into it. This is VERY Ponzi-like. However, the differences between a Ponzi scheme and Social Security have more to with their functionality; it is within that functionality that separates one from the other. Ponzi’s are dependent upon an unsustainable progression of participants. Ponzis only work if there is an ever-increasing number of new investors coming into the scheme based on the fact that the money being paid out is more than the money being taken in. There is no return generating mechanism beyond the contributions from new people coming into the scheme. The Ponzi must continually get more and more new people into the scheme for the pay-offs to work. Eventually, the number of participants requiring a pay-off would become far too large and the whole scheme would come crashing down. In contrast, according to the Social Security Administration, Social Security is a pay-as-you go system that is underwritten by incoming taxes. The money coming into the system is on balance with the money being paid out. The only dependency is the demographics of the population and their ability to pay taxes. If the population is stable, the system should remain in balance and could continue into perpetuity. Can States Opt Out of Social Security? Ironically, when Social Security was first enacted back in 1935 it was initially only for the private sector. It excluded the Federal, State, and local government employees based on the legal concerns that existed regarding the power of the Federal Government to tax State and local governments. [Editors note: in 1937, the Supreme Court ruled that Social Security is in fact Constitutional. See Helvering v. Davis] In a twist that I’m sure created a feeling of cognitive dissonance among conservatives, the law initially restricted the Federal Government’s authority over the States, but it created new taxes and regulations for the private sector – go figure. This all changed in 1950 with the “Section 218Agreements.” These agreements stemmed from the Social Security Act amendments of 1950, which were added to allow the States on a voluntary basis to obtain coverage for public employees who were not in a position covered by a public retirement system. However, in another fit of irony, in 1983 the Reagan Administration added more amendments to the Act. Reagan’s contributions required that all State and local governments covered under the Section 218 Agreements must continue – by law – Social Security coverage for their employees; they could no longer opt out. It was Reagan, using the power of the Federal government, who made it mandatory for those States using Social Security to stay in the system. Conversely, if a State or local government opted out of the Section 218 Agreements, they could remain outside of Social Security’s coverage. Today, States cannot opt out of Social Security; however, due to the amendments from 1950 there are about 15 States and a few local municipalities (about 5% of the population) that do not pay into Social Security. They do, in fact, have their own State or local pension program similar to the Federal program. Currently, those who do not pay into Social Security and collect a separate pension can have whatever they did pay into Social Security reduced through Government Pension Offset or Windfall Elimination Provision. This is to eliminate any possibilities of folks receiving extra benefits from retirement systems. 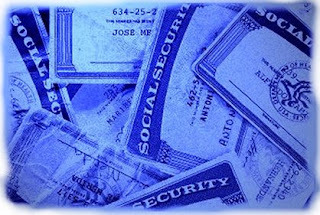 In your opinion, is Social Security a Ponzi scheme? Should States be able to opt out of Social Security?